Will Austin Voters End Retail Subsidies? Within two weeks, Austin voters will decide whether or not to allow city leaders to continue giving away millions of dollars in taxpayer-funded subsidies to retail-store developers. Although corporate welfare has become controversial across the country, Austin’s Proposition 2 is believed to be the nation’s first ballot initiative asking voters to ban retail subsidies. Retail subsidies are especially controversial, since the vast majority of retail stores operate without handouts. Moreover, a major rationale for subsidizing manufacturing plants—to create new jobs that pay good wages—is largely missing in action where the service-oriented retail sector is concerned. Domain mall in Austin, Texas. Photo from Austin City Guide. Supporters of Prop. 2 at press conference on Oct. 20, 2008. Photo courtesy of Stop Domain Subsidies. Stop Domain’s endorsers include 500 local businesses, many of which believe it is insane to pay malls to recruit outside retail chains to compete against homegrown shops. 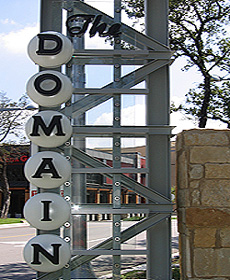 Some Stop Domain supporters cite a study estimating that for every $100 spent in a local store such as Bookpeople or Waterloo, $45 goes directly back into the Austin economy, while the same amount spent at a national chain like Borders injects just $13 back into the economy.16 To be sure, the Domain has not recruited all of its retailers from outside Austin. Some stores relocated there from other Austin locations, including the Arboretum across MoPac.17 If these stores already were doing business in Austin, did they really need taxpayer subsidies? At a time when budget shortfalls of up to $36.8 million are prompting the city of Austin to make cuts that range from library hours to road maintenance,18 Stop Domain suggests that paying $65 million over 20 years to a lifestyle mall is a misguided priority. In one of the weirdest twists in this saga, Simon Property is denouncing similar subsidies that El Paso officials are considering granting to one of Simon’s competitors.20 Simon’s accusations against competing developer Regency Centers sound as if they were shoplifted from Stop Domain Subsidies. El Paso officials have considered several subsidy proposals to raze a shuttered Farah apparel plant and replace it with a mall. Six years ago they rejected a $20 million subsidy proposal for the site from Simon, which already boasts two El Paso malls.21 As officials this summer considered awarding $18 million in subsidies for that same site to be developed by rival Regency,22 a familiar fight erupted. 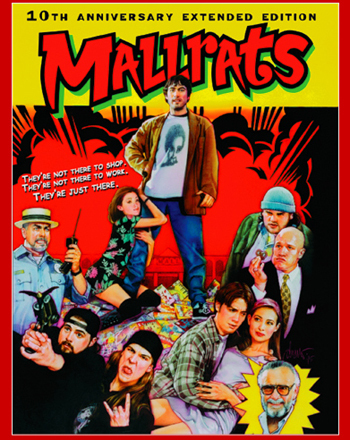 El Paso’s mall brawl features much the same cast of citizen groups, business interests and developers as the Austin fight. In a roll reversal, however, subsidy king Simon Property is one of the critics trashing El Paso’s mall subsidies. With an air of knowing whereof it speaks, Simon says that Regency misrepresented the project’s finances and misled people about the design of its project. Simon also complains that its competitor balked at “pirating” clauses that would limit the number of stores that Regency can lure away from existing shopping centers in the area. In a June letter to fellow members of the Greater El Paso Chamber of Commerce, two Simon executives expressed disappointment that the Chamber’s executive committee endorsed taxpayer subsidies for Regency. Simon’s letter has eerie parallels to the Domain battle. Simon’s El Paso letter also weighs in on the local chamber’s support for subsidies. “We’re puzzled that neither the Board of Directors nor the Chamber membership including Simon was contacted prior to its leadership’s quick decision,” Simon’s letter says. This recalls Stop Domain’s criticism of the Austin Chamber’s subsidy support (see below), as well as Stop Domain’s complaint that Austin fast-tracked the Domain deal to the detriment of public discussion. The main bulwarks against Stop Domain’s populist tide are the Greater Austin Chamber of Commerce and most of the Austin City Council (council member Laura Morrison has yet to state her position on the issue). 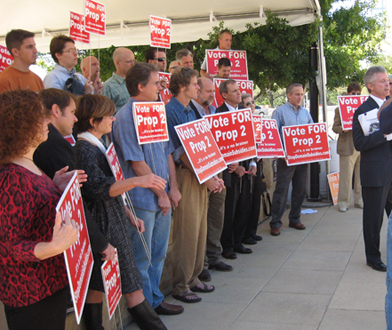 Former council member Betty Dunkerley, who voted for the Domain subsidies in 2003, heads Keep Austin’s Word—a group formed to defeat Proposition 2. Keep Austin's Word has raised $185,000 from just three sources. The Chamber's Greater Austin Economic Development Corp. provided $100,000, the Real Estate Council of Austin kicked in $75,000 and Simon Properties donated $10,000 worth of polling data.25 Countering Stop Domain, Keep Austin’s Word26 argues that the developers have acted in good faith and have not misrepresented the complicated Domain project. Saying that the developers kept their word, Keep Austin’s Word argues that Austin also must honor its commitments. Some city and state governments around the country have begun to question whether or not it makes sense to provide retail shopping centers with public subsidies. Public outcry against two Phoenix-area retail projects that received a total of $340 million in subsidies prompted the Arizona legislature last year to approve penalties that discourage any future retail subsidies in that part of the state.30 This year legislatures in Arkansas, Colorado, Georgia, Missouri, North Carolina and Washington considered imposing a variety of restrictions on retail subsidies.31 Yet Austin’s Proposition 2 appears to be the first time that citizens have taken direct action against the controversial practice of doling out taxpayer subsidies to retail establishments. After voting for a slew of candidates for the White House on down, Austinites soon will endorse the subsidies—or take retailers off the dole. “Watch Your Assets” is a Texans for Public Justice project. Author Paul Heberling is an intern at Texans for Public Justice. 1 The city has awarded more than $100 million in such economic development incentives to companies that account for a small fraction of the businesses that come to Austin or expand here each year. See TPJ’s “Austin’s Not-So-Smart Growth,” Watch Your Assets. Oct. 3, 2007. http://www.tpj.org/watchyourassets/austin. 3 Total payments were not to exceed $25 million over 20 years in 2003 dollars, with another $5 million from Travis County. See City of Austin/Endeavor Real Estate Group, Chapter 380 Economic Development Agreement, June 13, 2003. 4 One rationale for rapid passage appears to have been to let the developers recruit tenants at a Las Vegas convention. Whatever the reason, the city’s haste left negligible time for public scrutiny of the deal. “Wal-Mart or No, Council Defers to Endeavor's Domain,” Apple, Lauri. The Austin Chronicle. May 23, 2003. 5 There apparently was tension between Slusher and Endeavor principal Kirk Rudy. Shortly after the Domain deal passed over Slusher’s dissent, Rudy’s wife cussed Slusher out good. “Don’t *%@$! With Amy Rudy!,” Apple, Lauri. The Austin Chronicle. June 27, 2003. 6 These are cost estimates after values in the 2003 agreement are adjusted for inflation. Different assumptions account for the range in estimates. “No council action on Stop Domain Subsidies,” Humphrey, Katie. Austin American-Statesman. May 22, 2008. 7 “Bundlers make Texas cash a player in campaign,” Selby, W. Gardner. Austin American-Statesman. October 20, 2008. 8 “Unusual Insights: On the Wal-Mart backstory, the ‘Statesman’ displays its (yawn) everyday low standards,” Clark-Madison, Mike. The Austin Chronicle. November 21, 2003. 11 See Austin City Council Resolution No. 20071206-049. December 6, 2007. 12 See http://www.stopdomainsubsidies.com/?page_id=123 for the full text of Proposition 2. 14 Stop Domain sunk $22,500 of this money into an online documentary. “Campaign finance reports trickle in,” Alexander, Kate and Sarah Copolla. Austin American-Statesman. October 7, 2008. 15 Proposition 2 has garnered support from across the ideological spectrum, including Democratic, Republican, Green and Libertarian organizations. 17 “Report: Austin retail sales likely to increase 5% in '08,” Mistretta, A.J. Austin Business Journal. July 12, 2008. 18 “Financial Forecast & Presentation,” City of Austin Financial and Administrative Services - Budget Office. April 2008; “City grids for financial crisis,” Austin American-Statesman. October 17, 2008. 20 This deal is currently on hold after the El Paso city council approved the subsidies but county officials rejected them. 21 “Towne Center Questions,” Kolenc, Vic. El Paso Times. January 18, 2004. 22 “Simon Property Group protests tax rebates,” Kolenc, Vic. El Paso Times. August 12, 2008. 23 The letter estimates that “Cielo Vista Mall alone will conservatively lose a minimum of 15% of its existing sales” as a result of subsidized competition. 24 In August an El Paso weekly quoted one of the letter’s authors, Simon development vice president Rod Vosper, elaborated on these piracy concerns. “If the proper anti-piracy provisions are not part of the agreement,” Vosper warned, “the city’s current revenue stream is at risk and the city will be left dealing with new vacancy, new blight, for many years to come.” “Farah development in jeopardy,” Ryan Poulos, El Paso, Inc. August 31, 2008. 26 Even the name “Keep Austin’s Word” rankles Stop Domain Subsidies, which has complained that its nemesis hijacked the slogan and mimicked the logo of the Keep-Austin-Weird campaign, which supports local businesses. 27 Stop Domain activist Johnny Barnett counter-spins these kinds of arguments. “Having a reputation for being a town where you can’t mess with us, can’t cheat us, and can’t make promises you don’t intend to keep…is a good reputation,” he says. Barnett founded the pro-local business group Austin Unique. 28 “City fears Domain vote will ensnare Mueller,” Coppola, Sarah. Austin American-Statesman. October 13, 2008.